WASHINGTON — The two presidential candidates who entered 2019 with the largest bases of supporters — President Trump and Senator Bernie Sanders of Vermont — led the 2020 field in fund-raising in the first quarter of the year.Presidential candidates were under a Monday night deadline to file their fund-raising numbers for the first three months of 2019. The Trump campaign reported bringing in about $30 million in the quarter, while Mr. Sanders’s campaign raised about $18 million in the quarter.Other Democrats reporting large hauls to the Federal Election Commission included Senator Kamala Harris of California, whose campaign raised about $12 million, and former Representative Beto O’Rourke of Texas, whose campaign raised more than $9 million. ImagePresident Trump’s campaign said on Monday that it had raised about $30 million in the quarter.CreditSarah Silbiger/The New York TimesThe campaign of Pete Buttigieg, the mayor of South Bend, Ind., reported that it had raised $7.1 million in the quarter but spent modestly. His campaign ended the period with $6. 4 million in cash on hand. [Some candidates have also released their tax returns in recent days. See how they compare. 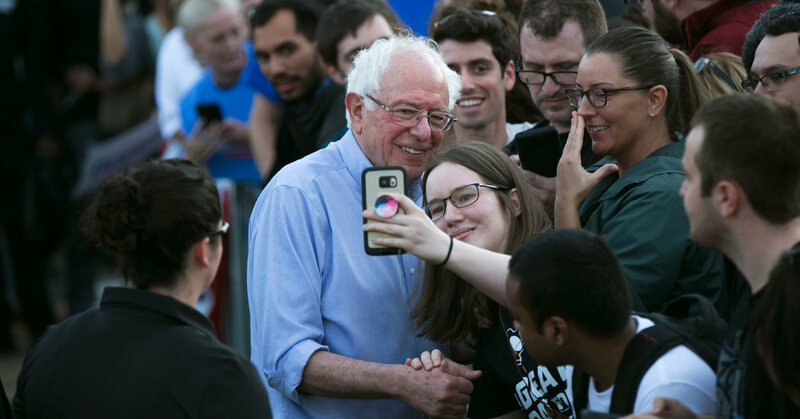 ]The fund-raising reports provide an early measure of how the Democratic candidates are picking up support in a crowded field. Many campaigns had already announced their overall fund-raising totals for the quarter, but the reports filed before Monday night’s deadline offered details about the money that the campaigns took in and spent in the first three months of the year. The deadline also highlighted the steep financial challenge facing some lesser-known candidates.Gov. Jay Inslee of Washington raised about $2.3 million in the quarter, while former Gov. John Hickenlooper of Colorado raised $2 million. Only 10 percent of Mr. Hickenlooper’s total came from donors giving $200 or less. Both candidates entered the race in early March.Julián Castro, the former housing secretary, raised about $1.1 million.Another Democrat who is trying to gain more attention, former Representative John Delaney of Maryland, has plenty of money — but as a result of his own wealth, not an outpouring of donations.